vì nhiều khi người ta cần xem thông tin một địa điểm mà người ta không biết nó nằm ở đâu. Ok, Xác định là chúng ta không thể xây dựng database các poins, đường xá, hành chính cho cả nước rồi tính geocode rồi. Vậy sẽ tìm một service nào đó cung cấp dịch vụ geocoding thôi. Thấy hơi gò bó rồi đấy =)), thế thì next! 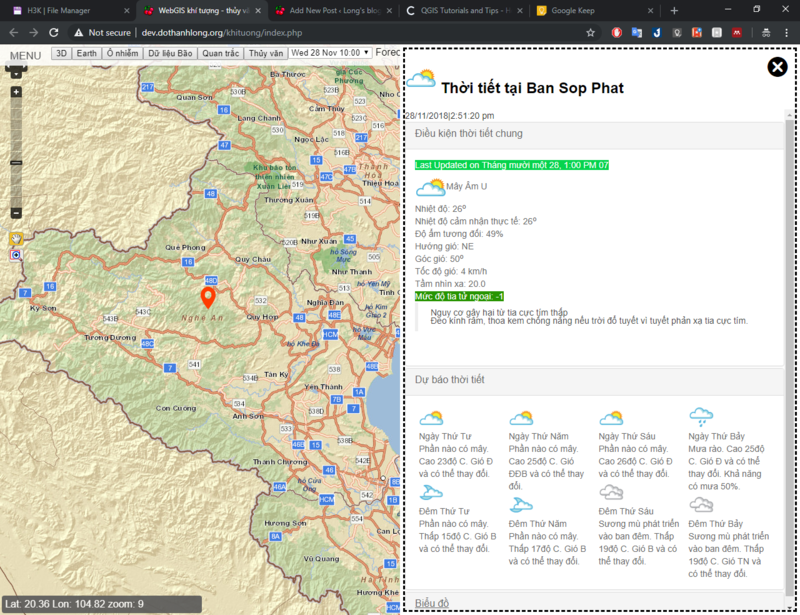 Ồ, thằng OSM thì xưa giờ được biết đến là dữ liệu free được đóng góp, chia sẻ bởi cộng đồng. Ngoài giao diện dùng cuối như hình trên, Nominatim cũng cung cấp services có thể trả về Json, XML hay HTML. Preferred language order for showing search results, overrides the value specified in the “Accept-Language” HTTP header. Either uses standard rfc2616 accept-language string or a simple comma separated list of language codes. (experimental) Alternative query string format for structured requests. Structured requests are faster and require fewer server resources. For North American addresses, use the full name for state to improve the results. DO NOT COMBINE WITH q=<query> PARAMETER. Limit search results to a specific country (or a list of countries). <countrycode> should be the ISO 3166-1alpha2 code, e.g. gb for the United Kingdom, de for Germany, etc. Restrict the results to only items contained with the viewbox (see above). Restricting the results to the bounding box also enables searching by amenity only. For example a search query of just “[pub]” would normally be rejected but with bounded=1 will result in a list of items matching within the bounding box. If you are making large numbers of request please include a valid email address or alternatively include your email address as part of the User-Agent string. This information will be kept confidential and only used to contact you in the event of a problem, see Usage Policy for more details. Limit the number of returned results. Default is 10. Sometimes you have several objects in OSM identifying the same place or object in reality. The simplest case is a street being split in many different OSM ways due to different characteristics. Nominatim will attempt to detect such duplicates and only return one match; this is controlled by the dedupe parameter which defaults to 1. Since the limit is, for reasons of efficiency, enforced before and not after de-duplicating, it is possible that de-duplicating leaves you with less results than requested. Output assorted developer debug information. Data on internals of nominatim “Search Loop” logic, and SQL queries. The output is (rough) HTML format. This overrides the specified machine readable format. 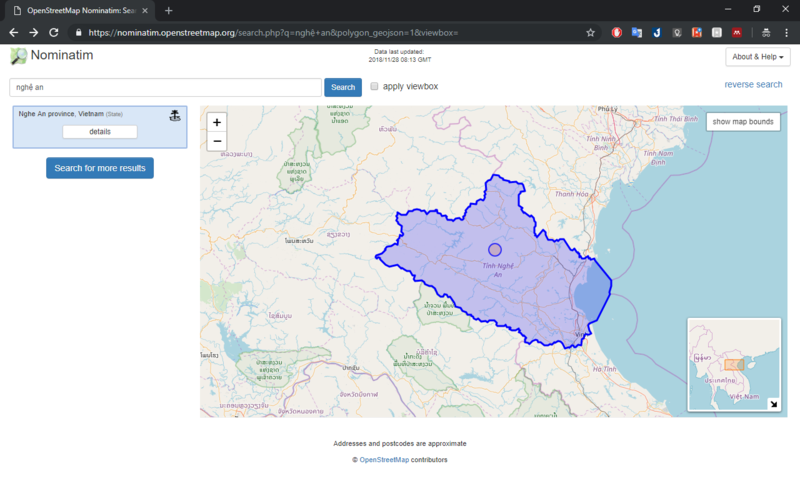 Output geometry of results in geojson format. Output geometry of results in kml format. Output geometry of results in svg format. Output geometry of results as a WKT. Include additional information in the result if available, e.g. wikipedia link, opening hours. Include a list of alternative names in the results. These may include language variants, references, operator and brand. Ngoài ra, nếu ta chọn polygon=1 thì chúng ta sẽ nhận được Geometry của đối tượng dạng WKT (Well Known Text). 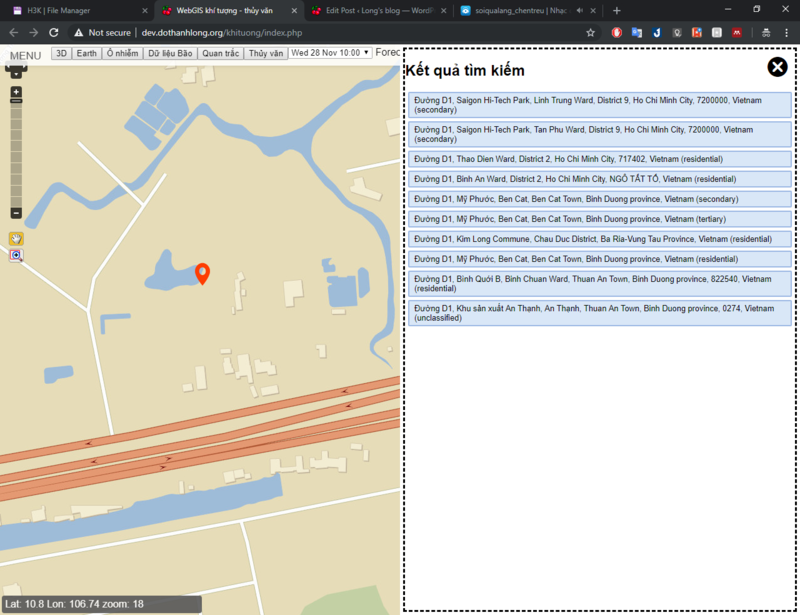 Từ các thông số trên, chúng ta có thể dễ dàng dùng các Map libs như Openlayers, Leaflet, GeoExt,.. để hiển thị, zoom đến đối tượng. 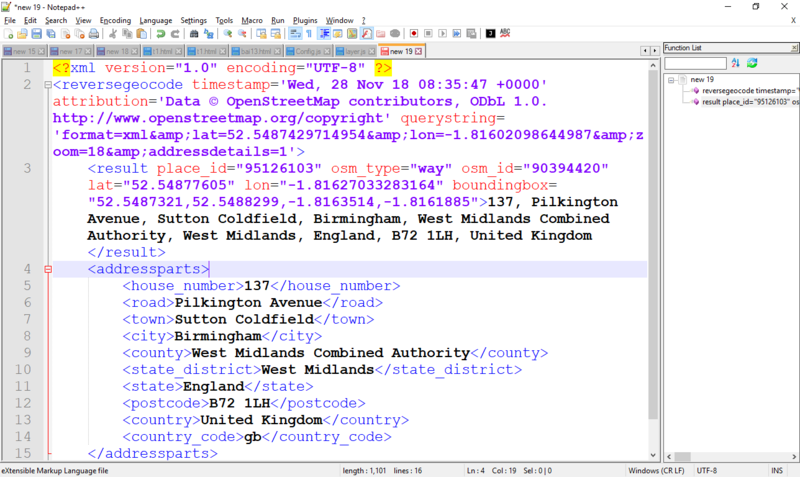 Reverse geocoding generates an address from a latitude and longitude. 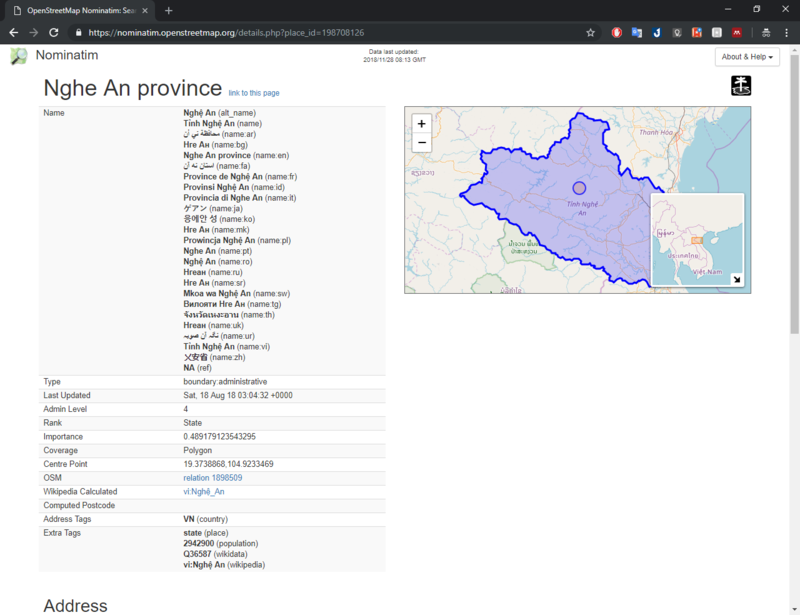 The optional zoom parameter specifies the level of detail required in terms of something suitable for a Leaflet.js/OpenLayers/etc. zoom level. Output format, default = xml. The importance is used for ordering search results according to their relevance. The importance value is calculated/estimated using various attributes including the place’s popularity on Wikipedia and its place_rank. or alternatively include your email address as part of the User-Agent string. event of a problem, see Usage Policy for more details. 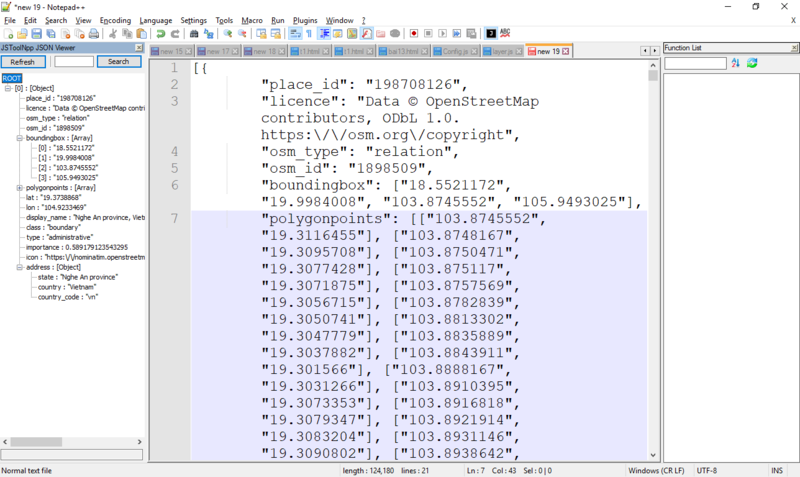 Output geometry of result in geojson format. Output geometry of result in kml format. Output geometry of result in svg format. Output geometry of result as a WKT.